If you need long-lasting energy, the new Alphacool Eispower Drink is for you. The biggest enemy during long, late-night LAN parties is tiredness. With the Eispower Drink, you can hang in there longer and show your enemies what you’re made of in any game you play. Getting tired while modding? An ice-cold Eispower Drink is the perfect thing to get your energy back up so you can keep going. Because who wants to quit right before the end? 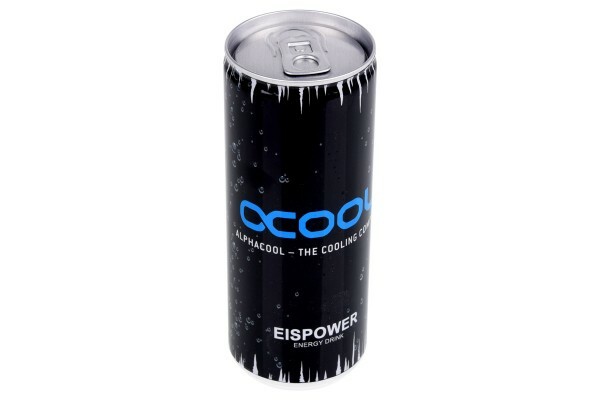 An ice-cold Alphacool Eispower Energy Drink is the perfect drink for every situation. Energy whey product blend. Increased caffeine content (30 mg / 100 ml). Pasteurised. Whey product (51%), Water, sugar, dextrose, carbonic acid, acidifier: citric acid; acidity regulators: sodium citrate, potassium citrate; flavouring, caramelised sugar, caffeine, taurine (30 mg / 100 ml = 0.03%), antioxidant: L-ascorbic acid, vitamins: calcium-D-pantothenate, pyridoxine hydrochloride, biotin; colourant: ammonium sulphite caramel. Caloric value 203 kJ / 47.7 kcal, egg white < 0.39 g, total carbohydrates 11 g, sugar 11 g thereof, total fat 0 g, saturated fats 0 g thereof, vitamin B6 2 mg (*142.9%), niacin 7.92 mg (*49.5%), pantothenic acid 1.98 mg (*33%), B12 2µg (*80%) / (*) = percentage of recommended daily intake. Mixing with alcohol can have unintended consequences. Only consume in limited quantities, especially during strenuous, athletic activity. Not intended for children, pregnant or nursing women, or caffeine-sensitive persons. Low lactose content.